The Ryan Licht Sang Bipolar Foundation is also proud to highlight some of our supporters and their unique efforts to spread awareness and understanding of Bipolar Disorder and to help erase the stigma associated with this insidious illness. “‘Polar Opposites’ is the name of this tree which was on view at the Ann Norton Sculpture Gardens West Palm Beach, Florida, for their inaugural Festival of Trees. Over two dozen themed Christmas trees were on view from December 1, 2007 through December 16, 2007. Trees were trimmed by school children, decorators, families, and individuals. 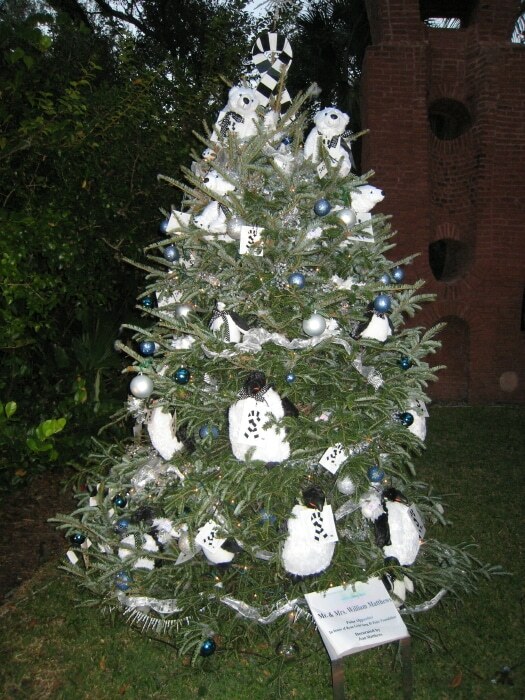 Jean Matthews used an enlargement of the Foundation’s Bipolar Awareness Pin as the tree topper and she placed North Pole polar bears on the top of the tree and South Pole penguins on the lower half of the tree. The polar bears and the penguins wore black and white polka dot bow ties and The Ryan Licht Sang Bipolar Foundation awareness bibs.